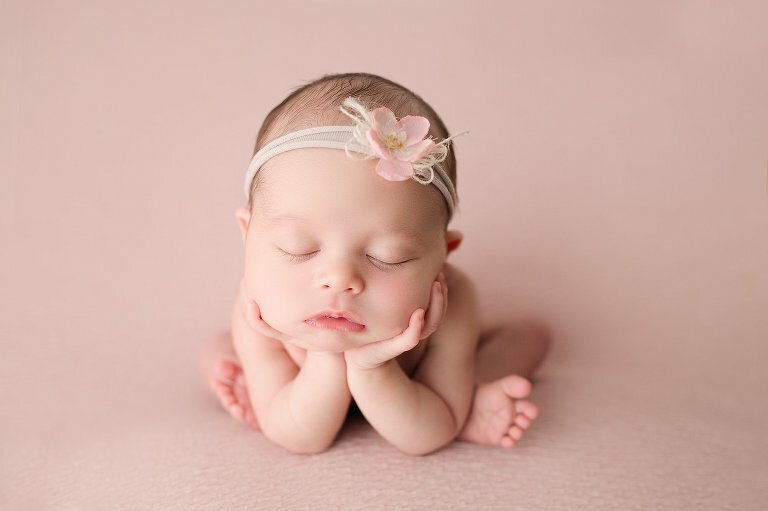 What a sweet squishy little newborn baby girl Miss Marciana was when she came into my studio! Named after her Great-Grandmother who had passed, she was just as beautiful as the women who came before her in her family. Her Mama brought in the card from Great Grandmother Marciana’s funeral and I was glad to be able to honor her Grandmother in the newborn session. This angel baby could not have looked cuter in every color and pose I put her in. Mom said she liked pinks and neutrals, and of course I have plenty of that! Baby girl loved being curled up on her tummy so I got to put some cute little white cotton pants on her and even wrap her in her moms beautiful veil. She stayed asleep throughout the whole session, especially when we put her in Mama’s hands. What beautiful ladies I got to photograph that day! Mom said she loved being pregnant with her, not one complaint. I think she’ll love having her little girl with her as well. The prop poses with baby girl were a lot of fun too. Baby Marciana looked gorgeous in peach, so I wrapped her up and put her in my weathered wooden bowl with one of my favorite floral wraps. I really loved where she was propped up on the sea rope with one of my new bonnets. I love the simplicity of that bonnet. I so enjoyed doing this session, I hope you enjoy the sampling of baby girl Marciana’s newborn session!